LINUS AND SOME MEMBERS OF KAFMOTEAM. A NICE BIG SIZE TROPHY. CAUSE WE HAVE A LOT TO DO / 3 CARS ARE UNDER CONSTRUCTION, WE DONT HAVE TIME FOR POSTING PICS & MORE RIGHT NOW.......COME BACK SOON! THIS WEEK WAS VERY WEIRD. WE DID NOT WORK A LOT ON OUR CARS IN LAST TIME BUT THIS WEEK IT WAS A BLAST. WE PREPARED CHUANS GEARBOX FOR HAVING THE 1835CC MOUNTED SOON. IT WAS A BIG FUN SEEING CHUANS HOUSE BURNING DOWN....ALMOST, HAHAHA. THE GRINDING OF THE GEARBOX WAS A HELL OF FIRE. WE ALSO REMOUNTED CUSTOMS SHELL BACK ON ITS FRAME AND IT FITS PERFECT NOW. WE ALSO HAVE HAD FUN IN MUNICH AT THE 60 ANNIVERSARY CLASSIC VW MEET. 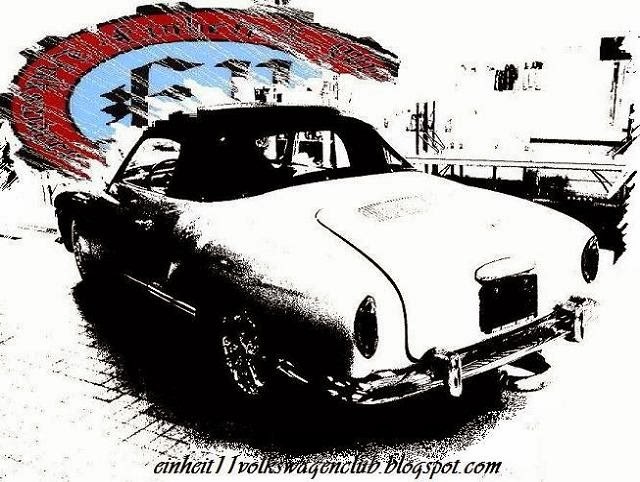 FOR US IT WAS THE BEST SHOW THIS YEAR AT LEAST WHAT APPROACH CLASSIC VWs. WE ALSO TOLD U THAT WE WILL DO SOME COMMENTS TO EACH PIC......HONESTLY, RIGHT NOW WE HAVE PROBLEMS WITH THE BLOGGERSYSTEM......IT TAKES HOURS FOR UPLOADING PICS AND TEXT AT ONCE. THAT MEANS......WE WILL SEE WHAT HAPPEN. HERE SOME PICS OF THE MEETING. WORLD WITH HIS BUG SINCE THEN. UNLASTING LIVING IS BACK IN OUR GARAGES. ALL GUYS FROM E11 ARE BACK FROM HOLIDAY AND NORMAL WORKINGDAYS HAVE BEEN STARTED AGAIN. AS EXPECTED MOTIVATION IS NOT ON TOP OF EVERYONE BUT A COUPLE OF US RESTARTED WORKING ON THEIR PROJEKTS. WE ALSO DECIDED NOT ONLY DOING A RÈSUMÈ EVERY WEEKEND, WE ALSO MAKE SOME COMMENTS FOR EVERY PIC WE POST. MEETING IN THE SWISS MOUNTAINS. THE PIC SHOWS PIERUELs & TOMs TYP 3s. BOTH CARS WERE BUILD TOGETHER WITHIN 2 WEEKS....CALI-LIKE / DAZZLERS ! CHUANS 58 PROJEKT PART 1: TOM AT WORK.....PULL YOUR FINGER OUT, MAKE IT SNAPPY, COME ON, HAHAHA. CHUAN ALSO IS HARD WORKING ON HIS CHASSIS. ITS ALMOST FINISHED, SANDBLASTED, POWDER-COATED & ASSEMBLED WITH ALL NEW PARTS. 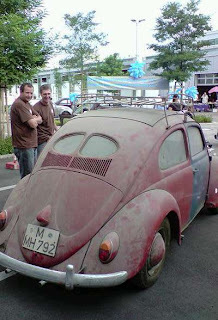 CUSTOMZONE WINTERTHUR: OUTSIDE THE HALL THERE WAS A NICE OLD SPLIT WINDOW, OWNED BY THE ,, LAKEBROTHERS ,, AND ALSO THE SHOW HIGHLIGHT WAS OWNED BY THE ,, LAKEBROTHERS ,, ITS THE FAKED, CHOPPED SPLIT WINDOW, NAMED ,, HAMMERED INC ,, A SUPER SANO BEETLE. ,,DGO,, ALWAYS LOOKING GOOD ALSO BETWEEN ALL THE US CARS. PHILS CUSTOM BUG: HERE SOME PICS OF E11 MEMBER PHILS CUSTOM CONVERTIBLE. THIS CAR IS A TOTAL BUILD UP RESTORATION. EVERY NUT & BOLT IS BRAND NEW. IT HAS A BIG BORE ENGINE, BILLET PARTS & WHEELS, DIGITAL DISPLAY ETC.ETC. AT A TESTDRIVE ON A 1/4 MILE WE DID 13.02SEC. NOT BAD FOR UNFINISHED CAR, HMMMMMMM?! WE HOPE THAT WE HIT THE LOW 12s NEXT YEAR.